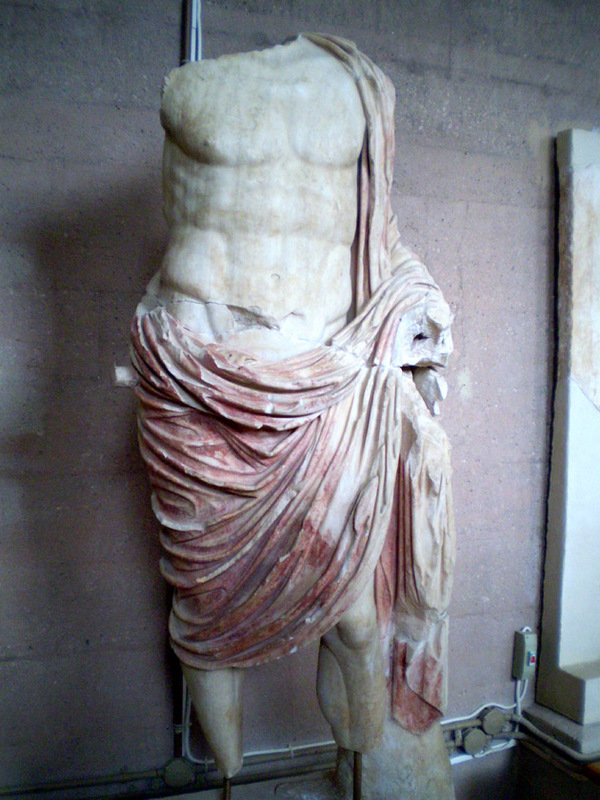 This incredible Roman imperial statue was uncovered at Corinth and is on display at the small museum there. As you can see, there is still a very strong red color on his robe. Given his size and styling, this statue was meant for public installation as propaganda for the emperor. I can only imagine how rich that brilliant red robe must have been 2000 years ago! I’ve been trying to imagine what they looked like for years! It’s the same deal with Medieval sculpture – so tricky to imagine with the original paint, but undoubtedly brilliant back in the day! Thanks for sharing that photo! Thanks! I also look at the decorations at Pompeii to image how colorful things may have been in the Classic world. Speaking of Medieval sculpture, have you see some of the amazing cathedral light shows? I did a post on the Reims Cathedral last year which had some fantastic shots of the colored facade. I have not seen them! I’ll have to look into that! It’s so funny that you should mention Reims – I’m going there tomorrow!